An interlude from the seasonal beer, this one a new one to me from the all organic Braumanufaktur range which I have sampled a few of. This one styled a keller bier…….. Very light aroma of malt, some toastyness and butter toffee from the pour. Werdersches pours cloudy amber brown with a creamy white head. Quite a sweet (medium) malty intake with butterscotch or diacetyl which ever way you want to judge it along with some fruit and yeasty notes while the finish ends slightly sour with no bitterness to speak of. Short aftertaste of malt and more of the yeasty sourness. Very soft carbonation and the mouthfeel is silky smooth and creamy. I enjoyed this one, easy to drink and not a whole lot going on to make you think too much. You could say boring but I would rather say simplistic. The constant through their range I have tried is that buttery note, or diacetyl which I don't mind most of the time while some people hate it. I would have no problems buying and sinking a few more though there are far better options of this style out there. 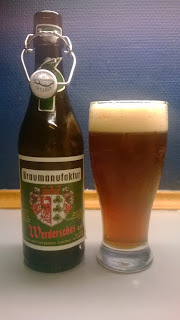 Summing up, easy drinkable kellerbier, not the best and not the worst. Average. This scored 4/10 on the 'the smugness on my face with 5 weeks off is unbearable to many' Beerometer.